What is a hand sanitizer? A hand sanitizer is used as an alternative to handwashing with soap and water. It comes in the form of gel, liquid and foam. I honestly find it convenient especially when I'm out and no wash room is in sight or if there are no soaps available in the wash room. Ingredients: This sanitizer is compose of alcohol, aloe vera, carbomer, perfume, triethanolamine and beads. Like most hand sanitizers this product promises to help kill bacteria, keeping the hands clean. The product is flammable so it's best to keep it away from direct sunlight, heat or flame. 1. Squirt a pea size amount on your palm. 2. Briskly rub your whole hands together until dry. Cheap. Priced at 2 SGD at Watsons. It comes with a cute pink jelly wrap carrier. The carrier enables me to wrap this product around my bag handle for easy access. The jelly wrap carrier comes in different colors too. I love variety. Expiration date is printed at the back of the packaging. I had no idea hand sanitizers expires. It could be because of it's ingredients. Well, it's good to be in the know. It doesn't dry my hands. Scent: Bubble Gum. I'm very particular with scent. I don't like strong scents because it'll give me a headache and runny nose. The scent from this product is not that strong. It'll gradually disappear over time. I don't really apply hand sanitizer that often because I'd prefer washing my hands with the usual soap and water method, but it's also good to keep one just in case. This product is cheap and does the job but I don't like the sticky feeling it leaves. Overall the product delivers. Will I be buying it again? I doubt it. I just don't like the sticky feeling it gives me. 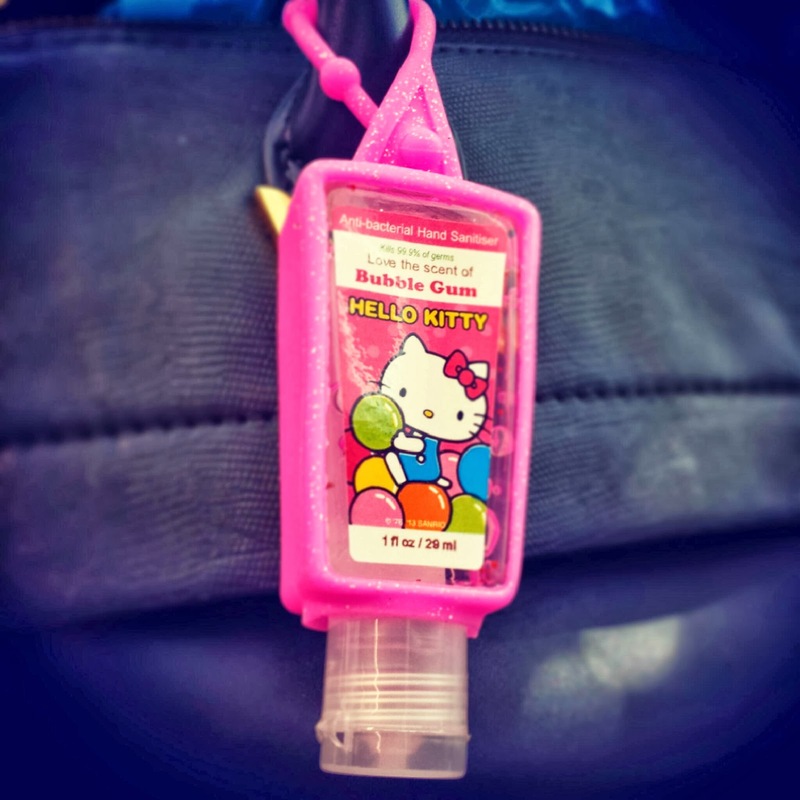 Have you tried the Hello Kitty Hand Sanitizer? What hand sanitizer have you been using or have used so far? Do let me know your thoughts in the comment section below too.